La Ferme Saint-Aubin, on the Île Saint-Louis. Good things come in small packages. There are two islands in the middle of the Seine. One, the Île de la Cité, is home to Notre-Dame, which must be second only to the Eiffel Tower in tourists welcomed per year. Next to it though, far less frequented and far more charming (in my view at least), is the Île Saint-Louis. With quaint streets, cafés, and boutiques and vistas out onto the city, Île Saint-Louis is a picturesque and pleasant place to spend a day. Nestled in between the cafés and boutiques on the busy Rue Saint-Louis en Île, La Ferme Saint Aubin is overlooked by the throngs of gelato and Berthillon ice-cream-seeking tourists which makes it all the more pleasant. The shop is tiny, not more than a couple metres square. Upon entry there was a refrigerator case with fresh milk products, like fromage blanc. 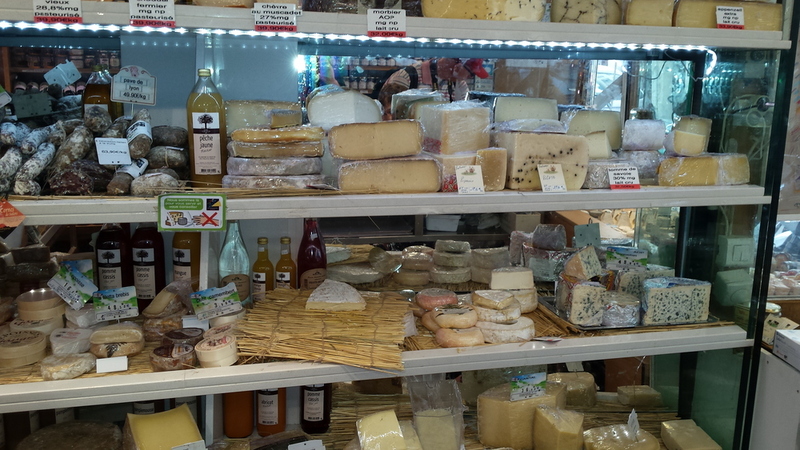 The cheeses were arranged on the wall on the right and in a display case that runs the length of the front window. Wall of cheese. There's my brie on the straw mat. I wrote recently about the Brie we bought there. We also bought one of the best chèvres I’ve ever had, called Bonde de Gâtine. At first glance, it looks a little funny, with grey-ish mold that resembles the texture of a brain. With one bite, any reservations caused by its appearance disappear. The cheese was really dense and almost chalky in texture. Even a small piece filled my mouth with the most incredible warmth. It was rich and tangy, as I’ve come to expect in goat’s cheeses, and a little on the salty side. I couldn't not stop in after walking past this window. The Bonde de Gâtine is stacked up just in front of the marble post. Our visit to La Ferme Saint Aubin that day was completely unscripted. The next one surely won’t be. La Bonde de Gâtine, a delicious goat cheese that fills your mouth with an incredible warmth. Defining characteristics: Grey rind with a dense, almost chalky interior. The cheese is moderately tangy but has a rich, warm, salty taste. Traditional accompaniments: Apart from a baguette, I’ve taken to enjoying chèvre with fresh cherry tomatoes that are in season. A bright white wine from the Loire (a Sancerre especially) or Burgundy will work well with this cheese. Recipes: I’m not sure I’d cook this chèvre. I’d rather see it as part of picnic with wine, fresh fruit and vegetables, and good company.